The Pooka in the form of a horse. There are many supernatural beings that populate the Emerald Isle, but there are few that are more feared than the Pooka. This is not just because the goblin has a terrible reputation for causing trouble, but because he can take many different forms. You may not even realise that you have had an encounter with one until it is too late. Its name is thought to derive from the Scandinavian word pook or puke, which means nature spirit. Many small lakes or springs in Ireland are known as Pollaphuca, meaning Pooka Hole. This may suggest a benevolent entity, but the truth is very different. This mischievous faery comes out at night to cause all manner of trouble, including tearing down fences, trampling crops and terrifying livestock. Cows will not give milk and hens may refuse to lay if this goblin has passed by. Any household unlucky enough to receive one of his visits will soon face financial misfortune too. All the roads belongs to this menace, and few dare to travel at night for fear they may encounter it. It is strong enough to push a man over a cliff or crush his bones by stamping on them. But his favourite pastime is to play a trick on unsuspecting drunkards. Those who leave the pub the worse the wear may find themselves offered a ride by a helpful black horse. But as soon as they climb upon its back, they will be whisked away at a terrifying gallop, to be left miles away from their intended destination and with no memory of how they got there. One of the things that makes this spirit so terrifying is that it is a shape-shifter, able to appear in a number of different forms. These vary according to region as well as the spirit’s mood. In County Down he appears as a small goblin, greedy for food and demanding a share of the harvest. It is no coincidence that the month traditionally associated with him is November, when the last of the food is being gathered in. In Wexford he is often an eagle, ripping a man’s body with his fearsome talons, whilst in Roscommon he takes the form of a foul-tempered goat, goring his victims with his terrible horns. Sometimes he is a bat or a large black bird, lying in wait at a crossroads before scratching the faces of unwary travellers. He can also take human form and loves to chat. As he engages his victims in a conversation, they are unwittingly drawn in by his charms and his surprising knowledge of their lives, not realising until later than they have just had an encounter with the mischievous beast and will shortly suffer for it. 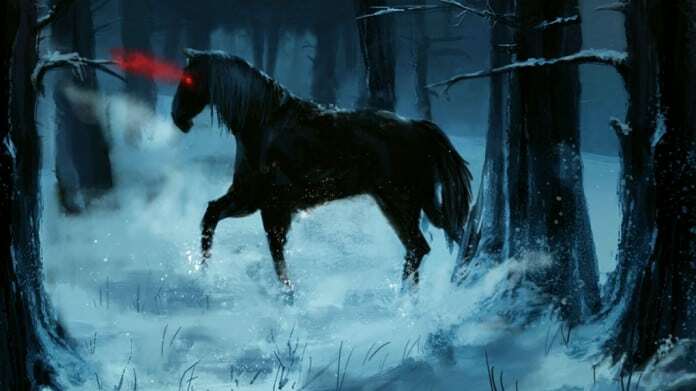 But his favourite guise is as a large black horse with a tumbling wild mane and sulphurous yellow eyes. Snorting and stamping, he roams the countryside and can be found wreaking havoc all over the open mountainous spaces of Ireland. There have been many reported sightings of this spirit throughout the ages. One of the most famous is when he allegedly led a pack of hounds into a raging torrent during a hunt. Along the boundary between Kildare and Wicklow there is a narrow gorge that plummets into the River Liffey. In 1813, a fox and the hounds chasing him were tricked by a large black horse into jumping into the gorge, where they all drowned. The impudent faery is also said to be the inspiration behind one of William Shakespeare’s most famous characters, Puck. This sprite appears in the play A Midsummer Night’s Dream and is hell-bent on causing all sorts of grief for many of the other characters. It is likely to be no coincidence that Shakespeare chose a name for this character so similar to that of Ireland’s notorious faery. He has also cropped up more recently in one of the most unusual films to hit the big screen. In the cult hit Donnie Darko, he appears as a giant rabbit, encouraging the main character to commit malicious acts. Many have fallen prey to the perils of this little beast, with few escaping from an encounter unscathed. Following an unfortunate meeting with the spirit, many have found themselves the victim of damage to their home or land or even facing financial ruin. There is one man who did manage to get the better of him. Brian Boruma Mac Cennetig, also known as Brian Boru, the High King of Ireland, lived between 941 and 1014. A brave and strong man, he was challenged by the Pooka, in its incarnation as a fearsome horse, to go for one of its legendary rides. Brian Boru pulled three hairs from the horse’s own tail and threw them round its neck to make a bridle. They became as strong as steel, allowing him to stay on its back until it eventually tired. Victorious, he made the mischievous faery promise two things. Firstly, he was never again to torment Christian people or ruin their property. Secondly, he would never again attack an Irishman, unless the man were either drunk or had evil on his mind. An accord was struck, although unsurprisingly, given the treacherous nature of the goblin, it has not always kept to its end of the bargain. However, its power is said to be greatly reduced, and it now contents itself with taking the odd foolish drunkard for a ride. The Pooka may not wield the dreadful power it once did, but it is not a goblin to take lightly. Although there are some reports that if it is well treated and given gifts the sprite may even give helpful advice, it is unwise to take chances. Anyone who accepts a ride on a horse after dark should beware that they may be tangling with a very mischievous faery!